The year 2017 is about to elapse. The global and regional situation continues to witness complicated developments. Major powers, particularly the U.S. (under President Donald Trump’s administration), have made adjustments in their policies and strategies, profoundly impacting the complexion of the world’s politics, security and international relations. Disputes over territory, sovereignty, national interests, racial and religious conflicts, terrorist attacks, flashpoints, increased armed races, development of nuclear weapons, and application of nanotechnology, genealogy, biology and artificial intelligence to army modernization continue to take place in many regions. Trade protectionism and extremist nationalism tends to be on the rise. Non-traditional threats, terrorism, cyber warfare have become global issues threatening national sovereignty and interests as well as relations among countries. Against that backdrop, the whole military is striving to implement the Resolutions of the 12th National Party Congress and the 10th Army Party Congress. To improve the effectiveness in carrying out the work of defence diplomacy, the Central Military Commission and the Ministry of National Defence have directed the entire military to thoroughly grasp and concretize the Party’s guidelines and the State’s policy on foreign affairs, with a focus on the Resolution of the 12th National Party Congress, the Government’s Decree 22/2016/NĐ-CP, dated December 31st, 2016, regulating defence diplomacy, the Central Military Commission’s Resolution 806-NQ/QUTW on defence international integration and diplomacy until 2020 and beyond. Right in the early tenure, the Central Military Commission has directed relevant agencies to build up the Project “Defence international integration until 2020, vision to 2030”, ratified by Prime Minister on September 11th 2017, creating a legal framework and laying a foundation for the Ministry of National Defence in cooperation with other ministries, central and local sectors and committees to implement nationwide. As a result, the Central Military Commission and the Ministry of National Defence have proactively led and directed the whole military to conduct the work of defence international integration and diplomacy in accordance with the Party’s guideline and the State’s policy, thereby producing important, breakthrough results. The Ministry of National Defence has given sound advice to the Party and the State on diplomatic strategies and policies concerning the military and defence fields and on solutions to sensible, complicated issues in international relations, particularly sea and border issues. Agencies and units have actively taken part in international integration and diplomatic activities of the Party and the State effectively. Delegation exchanges at levels, deputy ministerial-level defence dialogues, and working-level consultations with countries have been organized on schedule, effectively, safely and economically. Units and agencies have actively participated in multilateral defence forums, the UN peacekeeping, search and rescue, cooperation to overcome consequences of natural disasters and wars as well as in joint patrols, while proactively supplementing, completing and promulgating legal normative documents and building up projects and plans on defence diplomacy. Bilateral defence cooperation continues to be deepened and becomes a pillar in Vietnam’s relations with many countries, satisfying Vietnam’s strategic interests, greatly contributing to improving confidence between Vietnam and other countries, maintaining the balance of its relations with major powers on the basis of intertwined interests, and strengthening its relations with regional countries and traditional friends. Border defence diplomacy continues to be highlighted with outstanding activities. Notably, Vietnam proactively prepared and successfully organized the 4th Vietnam - China border defence friendship exchange on September 23rd and 24th, 2017, with practical activities, such as joint anti-terrorism exercise, joint patrol, helping people of border areas build houses of culture. Vietnam also successfully held a trip for Cambodian Prime Minister Hun Sen to revisit historical sites and witnesses on the occasion of the 40th anniversary of his journey to save the nation and the 50th anniversary of Vietnam - Cambodia relations. On the occasion of the 55th anniversary of Vietnam - Laos diplomatic ties, the two countries successfully organized the first border defence friendship exchange and other activities. Exchange and friend-making activities among border units and localities continue to be stepped up, which has contributed to strengthening Vietnam’s relations with its neighbours and building borders of peace and friendship. With the gained results, defence international integration and diplomacy has proved to be an important and effective channel directly contributing to defending national sovereignty, unification and territorial integrity, protecting the Party, the People’s State, the socialist regime and national interests, and maintaining peaceful environment and stability for the cause of national construction and development. Defence international integration along with international integration in other fields has greatly contributed to building confidence, bringing about the balance and intertwined interests among major powers, reducing the risk of conflicts, maintaining peace and stability for the region, while taking advantage of international strength to gradually modernize the weapons and equipment of the military and increase its combat strength, the country’s defence potential, status and prestige of the military and the country in the international arena. Defence international integration and diplomacy has firmly adhered to the Party’s guideline, playing the role as “a strategy to defend the Homeland from afar by peaceful means”, advocating “cooperation for development and Vietnam’s strengthened defence and security posture, closely combining with and facilitating international integration in other fields”. However, there exist limitations in defence international integration and diplomacy, such as limited quality of advisory work, coordination and information exchange between relevant agencies and units inside and outside the military have yet to be timely, close and effective. The complicated developments of the world and regional situation are posing issues to Vietnam’s defence international integration and diplomacy, namely the implementation of the defence policy of independence and self-reliance: no military alliance, and not relying on any country to fight against others; the development of necessary defence and military relations to a proper degree on the basis of respecting independence, sovereignty and basic principles of international law to strengthen strategic trust and take advantage of support for the cause of national construction and protection; and the settlement of the relationships between cooperation and defence struggle and protection of national independence, sovereignty and interests, between differences, interests and maintenance of peaceful, stable environment and friendship. To promote the results and overcome weaknesses, in the time to come, it is necessary to successfully fulfil the following tasks and measures. First, continuing to firmly grasp the Party’s guideline on diplomacy mentioned in the Resolution of the 12th National Party Congress, the Politburo’s Resolution No.22 (11th tenure) on international integration, the Resolution of the 10th Military Party Congress; stepping up education and propagation to raise people’s awareness and responsibility, and considering defence international integration and diplomacy as a regular, important task. Second, actively giving advice to the Party and the State on diplomatic strategies related to military and defence fields. Units and agencies should thoroughly grasp the situation and changes in strategy and policy of partners, particularly of major powers and neighbouring countries. There should be close coordination between defence diplomacy and diplomacy in other fields, between the Department of Foreign Relations, other agencies of the Ministry of National Defence and Central ministries, sectors, committees and localities in providing information, proposing guideline and policy and settling the situations of diplomacy and international relations properly. Third, strengthening bilateral defence cooperation, proactively preparing and organizing high-level delegation exchange activities. It is essential to regard Navy cooperation as a focus in bilateral defence cooperation, build up the Project on Navy’s international cooperation during 2021-2025, and hold joint drills on search and rescue for Naval vessels. It is important to step up international cooperation in strategic and military technical study, defence industry, transfer of technology and cadres training, particularly in information and technology and key subjects; to continue cooperation in military commerce; to simultaneously foster cooperation, trust building and relations with partners, particularly with our neighbouring countries and major powers; to take advantage of support of used equipment, meeting our demands and condition, and not drawing sensible responses from other countries. Process of defence cooperation, technology transfer and used equipment assistance should be carried out in a public, transparent manner in accordance with Vietnam and others’ law, not violating the UN sanctions or international regulations and conventions we have signed, not inflicting Vietnam’s defence policy. Fourth, successfully performing the tasks assigned by the Government in the year Vietnam holds APEC Summit 2017 with regard to multilateral defence cooperation. It is imperative to prepare the contents and initiatives for the 10th ASEAN Defence Ministers’ Meeting (ADMM) and the 4th ADMM Plus as well as the Master Plan for Defence Diplomacy 2020 when Vietnam takes over the Chairmanship of ASEAN so as to raise Vietnam’s prestige and promote the role of the country and the Military in the region. 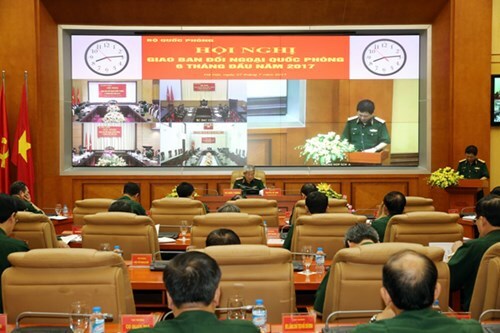 It is also important to make preparation for taking part in a number of multilateral exercises on humanitarian aid (search and rescue, disaster relief) and elimination of war aftermath; for organizing the conference on reviewing Vietnam’s 3-year participation in the UN peacekeeping operations; for taking part in upcoming activities as planned. Fifth, improving the quality and effectiveness as well as the contents of border friendship exchanges with China, Laos and Cambodia; organizing exchanges with Thailand and Myanmar; building up a bilateral forum of countries of mainland ASEAN on cooperation in land border protection; and actively involving in demarcation and protection of Vietnam - Cambodia border. Sixth, setting up and carrying out programs, plans, and projects for elimination of war aftermath. It is necessary to build up the Plan for defence diplomacy work 2018 and the action plan for the Project on “defence international integration until 2020, vision to 2030” ratified by Prime Minister; to complete the circular guiding the implementation of the Decree 22/2016/NĐ-CP on defence diplomacy; to report Prime Minister on assigning the Ministry of National Defence to the building of a decree in place of the Decree No.104 regulating the arrival of foreign military vessels in Vietnam; to complete the Project on organization and consolidation of units under the Steering Committee for eliminating the remnants of war such as unexploded ordnance and chemical agents according the Decision 701/QĐ-TTg, dated May 24th 2017, by Prime Minister; and to speed up the completion of the stage 2 of the Project for dioxin clean-up in Da Nang and at Bien Hoa airport. Seventh, continuing to reform propagation and stick to activities of diplomacy and defence diplomacy of leaders of the Party, State, Central Military Commission and Ministry of National Defence, bilateral forums, important international conferences and events, the UN peacekeeping, border defence diplomacy as well as diplomatic activities of military regions, services and arms. The work of propagation must focus on demonstrating Vietnam’s defence policy of independence, self-reliance, peace and self-defence. It is essential to increase the amount of time and capacity of defence diplomacy information and propagation on the Vietnam National Defence Channel and in the press; while innovating the method of information and propagation in a more specialized, skillful, exciting and convincing manner to both strengthen cooperation and fight against wrongful arguments and distortions. Eighth, strengthening and completing the structure of agencies, units and forces responsible for defence diplomacy in the whole military. There should be a focus on the work of training and cultivating cadres to make them politically strong, expert in professional competence and foreign languages, meeting the demands for defence international integration and diplomacy in the new situation. Also, there should be a combination of resources and an increase in building facilities and providing means and equipment for the forces responsible for land and sea border diplomacy and participation in defence cooperation, joint patrols and exercises and the UN peacekeeping. To achieve better results in the work of defence diplomacy, units and agencies in the military should perceive and seriously implement the guideline: “defence international integration and diplomacy serve as a strategic direction”; “being active, proactive, steady, flexible, effective, avoiding contingency situations and passivity” in order to contribute to the successful fulfilment of the task of national construction and protection.